Street Pole Banners are an ideal way for councils and regional authorities to promote events, festivals and services. 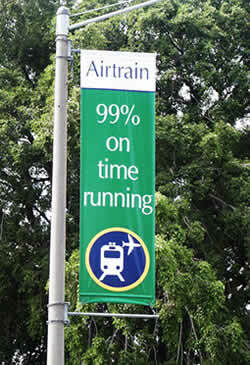 Otherwise known as Street Banners, they are produced as double sided units and are mostly hung from street light posts. 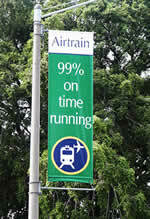 Whether highlighting a service, as with the Airtrain Street Pole Banner pictured, or for creating a festive atmosphere, Street Pole Banners are a flexible means of communicating your message to the public. Size is crucial on these banners, and we go out of our way to ensure accurate printing and finishing of Street Banners to size, thus ensuring a smooth installation.